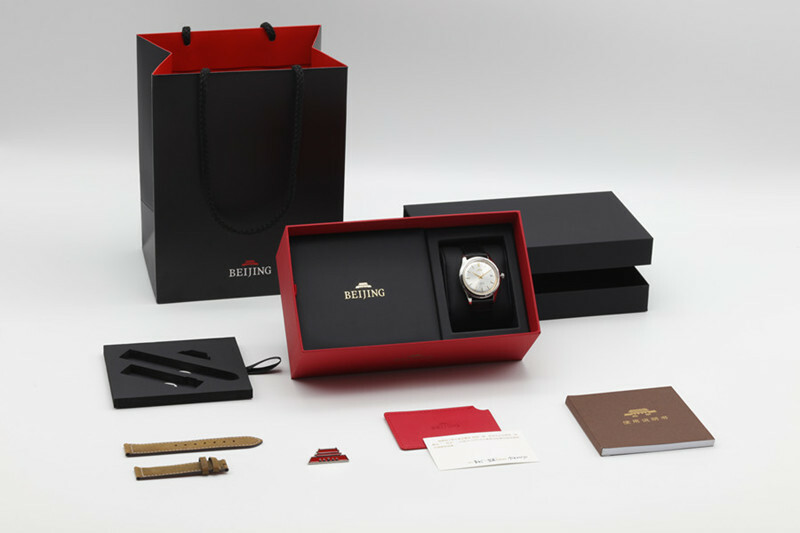 Into December, everywhere filled with the atmosphere of Christmas,Beijing Watch launches “Original Watch” Imperial Palace Gift Box,when the "Beijing Red" meet "Christmas Red",what will happen? Here comes a sneak peek today. Beijing Watch “Imperial Palace” Gift Box，which inspiration from extreme-simplicity oriental aesthetics and architecture.It is matched with specially selected paper materials to present low-profile but luxury quality feelings. Its tactile impression is a little bit fleecy. The obverse side is imprinted with brand logo of Beijing Watch. It is the first time for Beijing brand to make a stage pose to the public after upgradation. Tian'anmen Rostrum is combined with gilt-edged “Beijing” characters to fully manifest international and fashionable style, which can be revealed by the pierced “L” type. The pierced “L Type” of Red Gift Box appeared when seen from a side view of 45-degree angle. “L” extracts inspiration from extreme-simplicity connotations characterized by “Less is More” and it is concurrently the gear which opens Gift Box”. It breakthroughs opening method of conventional up and bottom cover and it is a box which can be pushed open. Gently push the position of “L” Type, Gift Box will be officially opened. “Original Watch” was the first wristwatch launched by Beijing Brand in 1958. It has led the fashion of an era, but also has represented its authentic strength and status obtained since the beginning of establishment. At the present time, this classic wristwatch is still sought-after by numerous watch lovers with overwhelmingly distinctive style. Replica “Original Watch” was placed at right side of inner box. Remarkable brand identity of Beijing brand is printed on black box cover. A new round of surprises will be revealed once the box is opened from red stripe of lateral side. The interior is divided into two layers.A piece of exquisite red Tian’anmen Brooch and crazy horse leather which are presented at the upper layer.The leather material which concurrently has frosted and fleecy feelings will liberate you from daily life and bring about previously unimagined rough style. The lower is the watch ID and instructions. On December 12, Replica Watch Gift Box were synchronously offered for sale at Beijing Watch Counter, Tmall “Beijing Watch Flagship Store” and JD “Beijing Watch Self-run Flagship Store”. Since its brand establishment in 1958, Beijing watch has used its distinctive pioneering spirit to promote brand progress and forward development along with vicissitudes of times. Beijing Watch consistently remains dedicated to independent production of high-complexity movement and customization of high-end wrist watch, emphasizes craftsmanship spirit and artistic aesthetics, perfectly blends top-notch techniques with cultural connotations as well as retains the essence of hand-made manufacturing to the utmost extent.